Our Sunday Internet Auction #1032 offers a fantastic selection of 450 New Items, along with 50 Special No Reserve lots and 25 Vault Value items. Highlighted by the second installment of the Creole Collection and a trio of large gold coins, a 1907 High Relief $20 PCGS/CAC MS64 (Wire Edge), a 1915-S Panama-Pacific Round $50 PCGS/CAC AU55 and an 1851 Humbert $50 PCGS VF35 (Reeded Edge, 880 Thous. ), this auction provides something for all levels of collectors. This week we are proud to offer Part 2 of The Creole Collection. We first featured 29 coins from this collection in Auction #1028 with fantastic results. 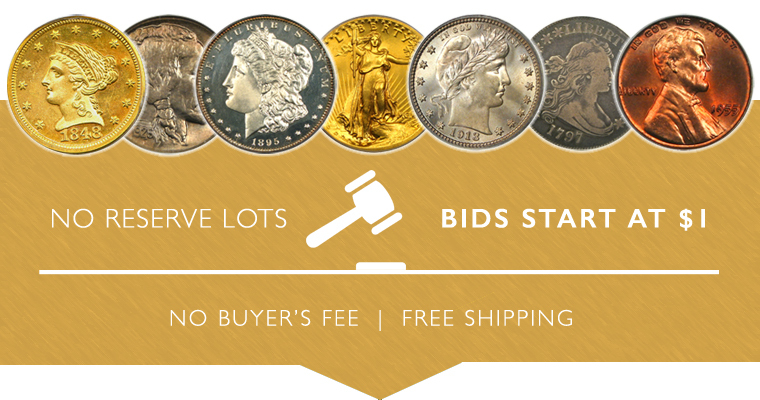 This second part of the collection offers a 42-coin assortment of coins across the realm of U.S. numismatics with a great assortment of Morgan Dollars and $10 Liberty and Indian Gold. Included in this offering is a beautifully toned 1900 1c PCGS Proof 66 RB, a popular two-year type 1839-O 50c PCGS XF45, a flashy 1883-CC PCGS MS67 (OGH), an 1892-CC $1 PCGS/CAC MS64+, a 1900-S $1 PCGS/CAC MS66 and a scarce 1908 $10 PCGS MS64 (With Motto). These and other registry quality examples make Part 2 of the Creole Collection a must see in Auction #1032. Our first highlight is a 1907 High Relief $20 PCGS/CAC MS64 (Wire Edge). The High Relief Saint Gaudens is one of the most popular of all US numismatic items and is CAC approved for quality. This week's second highlight is a 1915-S Panama-Pacific Round $50 PCGS/CAC AU55. Here's a great opportunity to pick up an affordable example of the famous Pan-Pac Round gold commemorative! There were only 483 pieces minted and these are much tougher in our experience than the Octagonals of the same issue. This exceptional example is CAC approved for quality. Our first highlight is av 1851 Humbert $50 PCGS VF35 (Reeded Edge, 880 Thous.). A reliable currency used in the period of the California Gold Rush, before the United States could produce enough coinage for everyday use. This choice VF example displays plenty of luster and light, even wear, mostly on the obverse, and the reverse is quite nice for the grade. Of course there are many other highlights, so be sure to browse all lots in this exciting new sale before it closes on Sunday, September 30th.